Anarchism is a set of revolutionary ideas that are, at root, very simple. Anarchists believe that we are all quite capable of looking after ourselves. No leader can know what you need better than you do. No government can represent the interests of a community better than the community itself. We believe that everyone should have the option to take part in decisions that affect them, wherever they take place. Only in this way can we have a fair and just society in which everyone has the chance to fulfil themselves. Everything in anarchist ways of thinking follows from this basic principle. For anarchists, taking back control over our own lives is the revolution. We see two ways of working as being key to being able to do this: direct action and self-organisation. Direct action is when those directly affected by something take action to fix it themselves, rather than asking someone else to do it for them. A strike that forces management to make concessions or face losing money is direct action where lobbying an MP or going through union negotiations is not. Squatting derelict land and turning into a community garden is direct action, whereas pressuring the council to clean up vacant lots is not. When we act by ourselves to achieve something that we need then we are taking direct action – whether that’s sharing food with others or fighting the police in a riot. For direct action to be possible then there also needs to be self organisation. This is organising without leaders or phoney ‘representatives’, and it allows us to take back the power to make our own decisions. Self organisation allows us to break down and overcome the hierarchies that separate us. In self-organised groups everyone has an equal say and no one is given the right to represent anyone else. This kind of group is capable of deciding its own needs and taking direct action to meet them in a way that any hierarchical group based on representatives – like a political party or a trade union – cannot. Because of this we reject the use of the state – that is government, parliament, the courts, the police and so on – to bring about revolution. No one can free anyone else. We all have to free ourselves by acting together. No government, even a ‘socialist’ or ‘revolutionary’ government, can do this. Any group or party taking over the state simply becomes a new set of leaders, exploiting us in the name of ‘socialism’ rather than ‘capitalism’. This is what happened in so-called ‘communist’ Russia. Only by destroying the state, not taking it over, can we free ourselves. 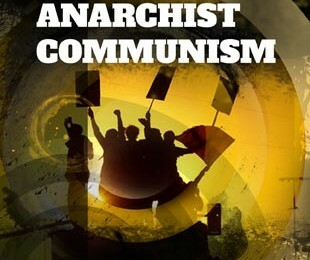 For anarchists, direct action and self organisation are essential tools for freeing ourselves. They are the way that we as a working class can confront the problems in our own lives collectively, working together against the whole system of capitalism and the ways it tries to divide us. These ideas have not just been plucked out of thin air. Anarchist communism is a living working class tradition that has worked in ways large and small throughout the history of capitalism. It does not come out of the abstract ideas of a few intellectuals but from the concrete actions of millions of people. For many, the word communism is associated only with the brutality of Soviet Russia, or with Cuba, China, and North Korea. These societies are amongst some of the worst tyrannies the world has ever seen, killing millions through famine, war and execution. As anarchists we don’t forget the prison camps, the slave labour, or the unjust trials and executions – indeed anarchists were often the first to suffer these attacks. However, unlike the press who use the example of ‘communist’ governments to claim that revolutionary change is impossible, anarchists also refuse to forget the example of the millions of people who have fought against this in the name of true communism. These people organised themselves, without leaders, into groups that used direct democracy, meaning that everyone had an equal say in how things were run. They used direct action, first against the state and capitalism, and later against the new Soviet rulers. The true communism that they fought for is the extension of these ways of working into every aspect of life. The communist slogan ‘from each according to their ability, to each according to their need’ sums up the idea. Nobody should be short of anything that they need. Individuals receive goods and services because of how much they need them, not because of how much they can pay or how much they deserve them. People give back to society, through the work they do, according to what they want and are able to do. Everyone will have the chance to do interesting and creative work, instead of just a minority while everyone else is stuck with boring drudge work. This society would be organised through local collectives and councils, organising themselves to make the decisions that need making and to do the work that needs doing. Everyone gets a say in decisions that concern them. We believe that in fighting for this kind of future we are fighting for the full freedom and equality of all. Only this will give everyone the chance to be whatever they can be. It is the many examples of people organising and resisting in this way that we call the communist tradition. The workers councils of revolutionary Spain, Germany, Russia, Hungary, France, and Mexico all give a small glimpse that we can look to when thinking about how we can fight capitalism and free ourselves. Time and time again the world has seen ordinary people using direct action, self organisation and direct democracy to build new societies and lives for themselves. It is these ideas and successes that we try to build on in today’s fight against exploitation. Anarchist communism is more than an abstract vision of the future and it is more than a nostalgia for the revolutionary movements of the past. It is a living working class tradition that lays the foundations for the future society in the here and now. Everything we will be after capitalism we must learn under it and through the fight against it. The revolution is not and never can be a blank slate – that way lies the corpses piled up by ‘revolutionary’ terror (such as happened in France, Russia, and China). Instead, revolution must be built out of the materials to hand by those of us alive today.